These are some of the items that are used in the daily life of the Mixtec. These items are part of a Mixtec Cultural Discovery activity at SDSU. First and foremost, the artifacts had to be cuturally authentic. Two Mixtec educators and ethnolinguists, Marcos A. Cruz Bautista (San Juan Mixtepec, Oaxaca) and Juan Juliàn Caballero (San Antonio Huitpec, Oaxaca) serverd as the project's cultural informants. They made suggestions on artifacts to include, described/clarified how the artifacts are used and who uses them, and assisted in obtaining them. We are immensely grateful to them for their guidance and participation in this project. Second, artifacts had to be items commonly used or consumed by Mixtec men, women and/or children, found in their homes today, etc. Artifcats emphasizing aspects of Mixtec culture that would be perceived as exotic by US students wer explicitly excluded from this project. In this regard, many artifacts were chosen because students would readily recognize them as counterparts to familiar items in their own culture. It should be noted that artifacts below are not necessarily exclusive to the Mixtecs, but may be used by other Mexican indigenous groups and/or the mestizo population as well. This sign will take you back to the top of the page. 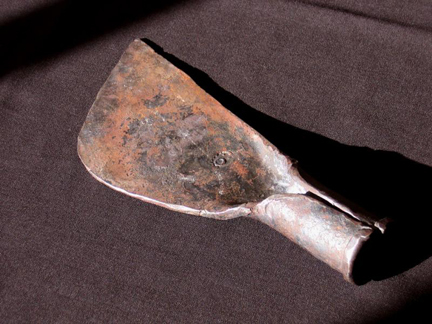 Accoring to project sources, this is the traditional corn planting tool used by Mixtec men.Also referred to in Spanish as a coa (hoe) or pala para sembrar (planting shovel), this piece would be outfitted with a stick of sufficient length to comfortably serve as a handle and for leverage. These pieces are fashioned individually so there are variations in their size and shape. The blade has been filed, by hand, to give it a sharper edge. 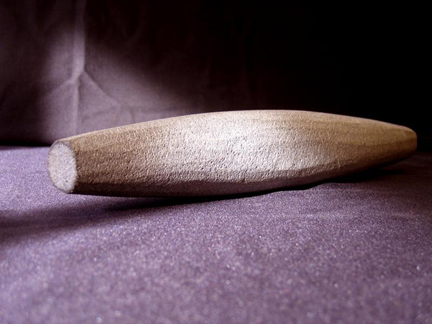 This elongated, rolling pin-like stone called a mano (hand) in Spanish is used to grind corn to prepare the masa (dough) for tortillas, a staple of the Mexican diet. It is used with a volcanic, rectangular-shaped, largely flat mortar called a metate as contrasted with the smaller, bowl-shaped molcajete used to grind chiles and other ingredients for salsas. Grinding corn in the home is typically a task for women. Palm and all the various products that can be woven from it have been a very important source of income for the Mixtecs. 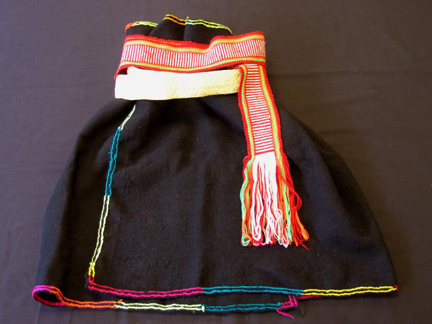 A woven palm hat is a mandatory part of Mixtec males’ – and other Mexican males’ – dress. Mixtec hats are considered some of the finest made. A Mixtec “backpack,” these baskets are ubiquitous in the Mixteca, where women, generally, can be seen transporting items in them to/from the market or elsewhere during their daily routine. The strap is most commonly worn across the top of the head but it can also be worn around the neck and shoulders. These baskets, known generically as tenates in Spanish, come in all sizes, with and without carrying straps and are used for carrying and storing all types of things. Formerly, all were woven from palm. 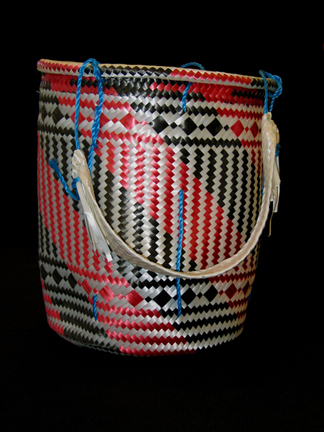 While baskets woven of palm can still be found, those most frequently seen are made of colorful synthetic materials, like this one. 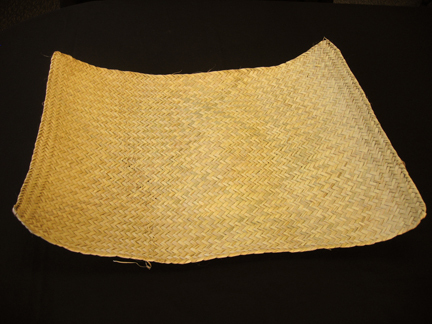 The materials are very durable and, unlike palm, require no special care and are available to basket weavers the year round. This is a traditional Mixtec chair. In some parts of the Mixteca, a female visitor to a Mixtec home is invited to enter and “sit on the petate (Spanish generic for palm mat) located near the entrance of the home. If the visitor is a man, he will be asked to “take a seat on the bench” (fashioned from a tree trunk) in the interior of the home. (This is a custom in San Antonio Huitepec, the hometown of Juan Juliàn Caballero). Mats are woven in different sizes. Larger ones are used to sleep on in rural areas throughout Mexico. 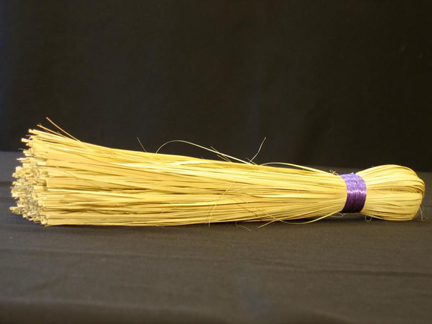 Another palm product, this is a small, all-purpose broom. It could be used in the kitchen to clean off table tops, the stove and its hearth (many stoves are wood burning) and other work spaces. Cacao, which is indigenous to Mesoamerica, has been cultivated in Mexico since ancient times. 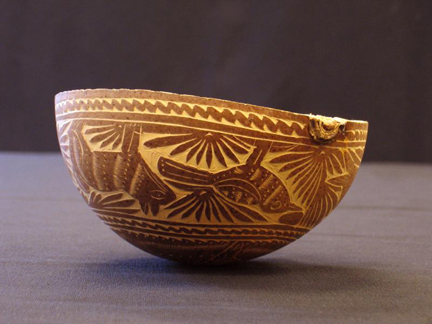 Pre-Colombian Mexicans prepared a chocolate drink which they served in gourd bowls/cups just like the one included here. Cacao was so highly prized by the ancient Mexicans, it was used as currency. These cacao seeds have been toasted, and once peeled, the pulp would be ready to grind with almonds and cinnamon, until liquid in texture, then ground a second time with sugar to make what we know as chocolate. Oaxaca is famous for its chocolate, which is routinely consumed as a breakfast or supper drink, made with water or milk. One of the two gourd items included here demonstrates the diverse ways Mixtecs find to use the same resource natural to their environment. The multi-purpose cup/bowl can be used for drinking water or chocolate, measuring, etc. They can be decorated with carvings, like this one, or left plain. These cups are sued in homes today and readily available at markets like the Friday mark in Tlaxiaco, where this one was purchased. It is interesting to note that in many Oaxacan restaurants today, hot chocolate is served in small bowls (although not gourds), rather than in cups with a handle. What do the carved designs reveal about the physical environment of the Mixteca? 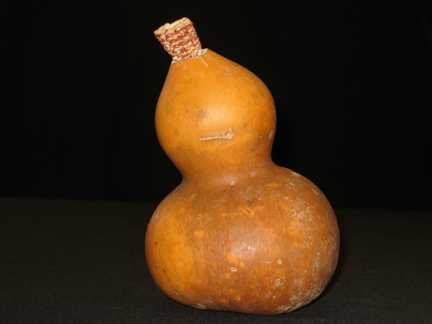 The gourd bottle, with its corncob stopper, can be used to store drinking water or mescal, an alcoholic beverage made from the fermented juice of the agave plant. Grasshoppers are a commonly, infamously consumed food item in the state of Oaxaca. They have been eaten since pre-Colombian times and are in fact a rich source of amino acids (the building blocks of proteins), vitamins and minerals (http://www.newton.dep.anl.gov/askasci/gen01/gen01234.htm). These are the larger variety; tiny red ones are hawked by street and market vendors throughout Oaxaca City. 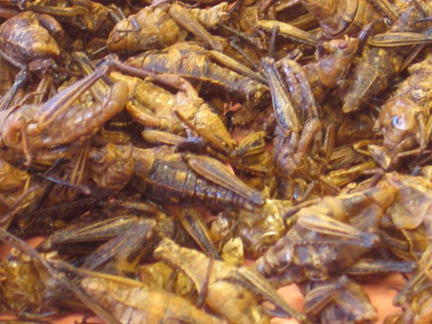 Tourist legend has it that if you eat a grasshopper, you will return to Oaxaca. Marcos Cruz Bautista, an informant, said live grasshoppers are harvested in the early morning hours during October, November, and December when they congregate in piles in response to the cold temperatures. Let collected grasshoppers sit for 24 hours to allow them to complete digestion of the contents of their stomachs. Rinse the grasshoppers in water, then allow to drain. Squeeze fresh lemon juice over the grasshoppers and salt them. Let marinate. Fry the grasshoppers in a non-stick frying pan over a low flame with a little oil or lard (for greater flavor) until they are golden. Serve the grasshoppers with fresh, hot torillas and salsa. 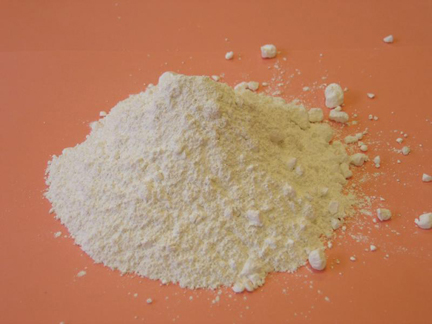 Copal is a natural, incense-type substance made from the dried sap (resin) of the copal tree. Smoldering copal releases smoke and a mild pine scent. 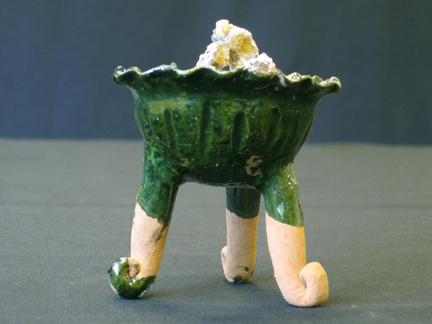 The green-glazed incense burner was made and purchased in Santa María Atzompa, a village on the outskirts of Oaxaca City, famous for the shiny green glaze of its pottery. The burning of copal as part of religious ceremonies dates back to pre-Colombian times; it has also become part of many Catholic ceremonies in Mexico. In the Mixteca copal burners can be observed in church services and religious processions for the Day of the Dead (November 1,2) and the feast days of patron saints. Hanging from the center of the bracelet is a seed called an ojo de venado in Spanish, (“deer’s eye”, scientific name Mucuna pruriens, also known as M. prurita). 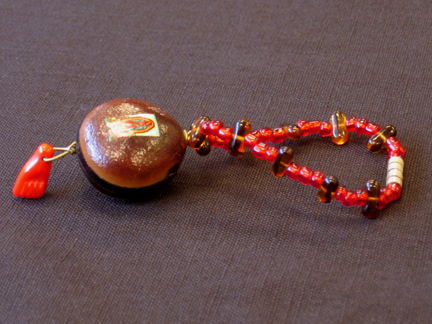 It is reputed to have power to protect against mal de ojo (evil eye). Hanging from the ojo de venado is a closed, plastic red fist, an adaptation of a “figa” or “fico” amulet of ancient Italian origin (Rues Kitchen) The figa, too, is supposed to protect against the evil eye. Red, for good luck, is a dominant color on the bracelet, while the yellow color of the amber-like beads offers protection against envy. This tiny bracelet is deigned to be worn by a baby or small child, although it might also be hung from the rear view mirror of an automobile. Such amulets are popular all over Mexico. These items are used to play “Kasia,” a traditional Mixtec game, a combination of marbles and Frisbee. Each player (or team) gets two large skipping stones. 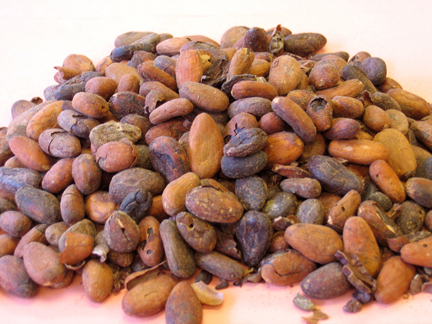 They also supply goodies to win – pecans, tender shoots of sugar cane, and Brazil nuts are commonly used in the Mixteca. The goodies are ladi out on a flat surface of about 7 feet in length. 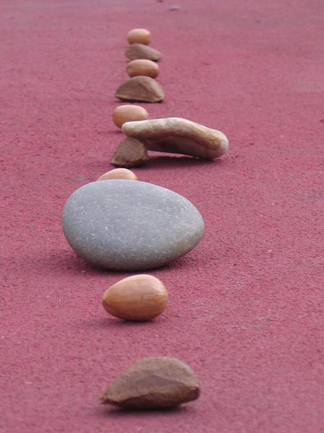 Players/teams take turns trying to make their stones skip across the tops of the goodies. They win each one their stone touches. If you would like to learn more about Kasia, please click here for directions, rules and a diagram of the setup.